Give your students the extra practice or enrichment they need. 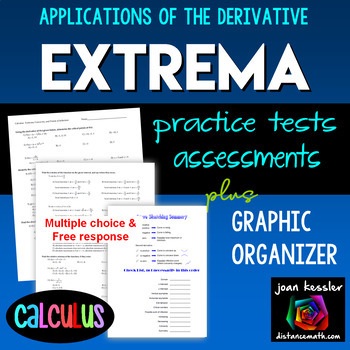 This resource is designed for AP Calculus AB, Honors Calculus, and College Level Calculus 1 and includes 4 versions of a handout for the Calculus unit on Extrema from Applications of the Derivative. 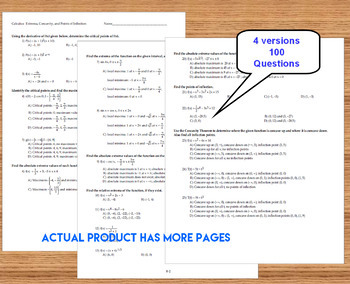 The handouts can be used as enrichment, homework, group work, or as an assessment. Each handout contains 25 well chosen representative questions. 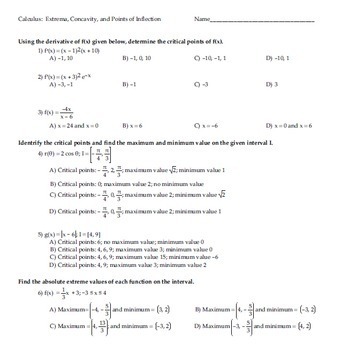 There are two multiple choice and two free response assessments and all four answer keys. Also included in this bundle is a Graphic Organizer to help students with Curve Sketching. ⇒ Did you know that you can earn 5% back for future purchases by leaving feedback? Your feedback is greatly appreciated. ⇒ Click Here to follow my store and be the first to hear about my freebies, sales, and new products designed to help you teach, save you time, and engage your students. 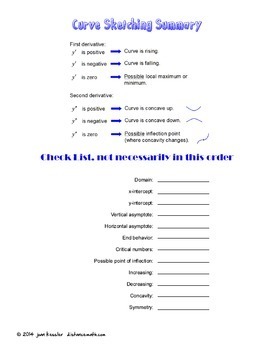 ©2016 Joan Kessler (distancemath.com™). Please note - this resource is for use by one teacher only. Colleagues must purchase additional licenses or you may purchase licenses for them at a discount. Note: You may not upload this resource to the Internet in any form.